CLOWNIN' AROUND WITH SERIOUS SAFETY TOPICS is the emphasis of this unique educational program that teaches fire and life safety skills to area school children. 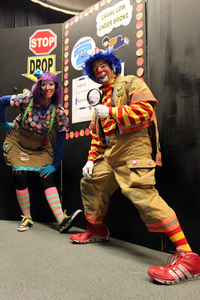 To make the presentations memorable, East Pierce personnel dress in clown costumes, silly make-up and funny noses. Designed for kindergarten through third graders, the 25-minute assembly-style format features songs, lots of audience participation, puppets, sound effects, and, of course, the clowns “Backdraft” and “Highrise”. The annual safety lessons include fire and life safety basics which include what to do in case of an emergency, how to call 9-1-1, the importance of exit drills in the home, what to do if a smoke alarm goes off and how to stop, drop, cover and roll if your clothes catch on fire. More importantly, the children seem to remember these critical safety lessons taught by our funny fire friends. They aren’t the only ones. “The teachers love the new format and students learned so much,” says Dieringer Elementary School Principal Connie GeRoy. By the time the troupe finishes performing at all 18 elementary schools within the fire district, they entertain—and educate—more than 5,000 students each school year.